Dragon stares out at the crater where the house used to be that he once shared with Jennifer Murphy and her daughter. He hopes that they are still out there somewhere alive and is not even entirely sure that they lived here in this reality. Dragon suddenly comes under attack by a super-freak named Crustacean whose words give Dragon even more questions to be answered. He is apparently an assassin and outlaw with a huge reward to his name. Crustacean’s attack causes both him and his intended victim to spill over the side of the crater and hurtle towards the ground. Dragon manages to gain a grip on the side of the giant hole and uses it to strike out at Crustacean, sending him flying off down towards the ground. He then climbs up to the surface where he is greeted by an older version of WildStar whom he recognises from a clash they had once several years ago in California. This version of WildStar speaks with his fellow hero but he soon realises that Dragon is not in possession of information that he needs, indicating that he has sought him out too early on in life. 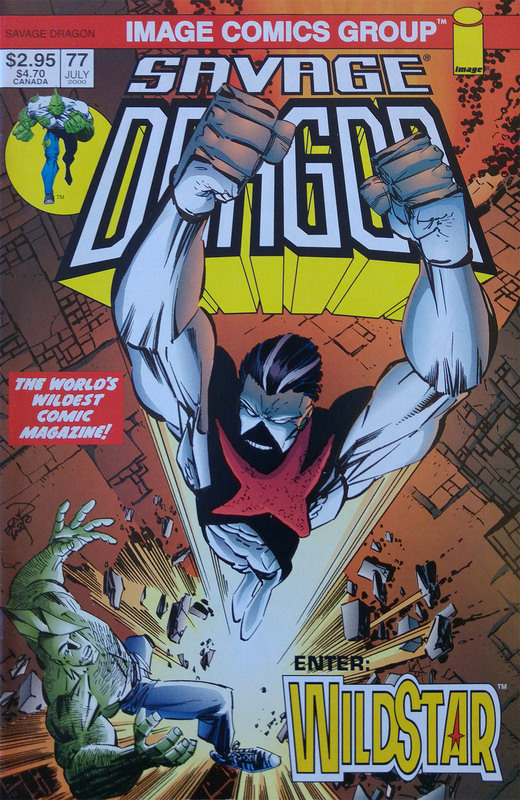 The time-displaced superhuman then departs in a hurry, leaving Dragon desperately trying to keep up as he is the first person that he has recognised since his arrival. WildStar leads his follower to where his younger self is locked in battle with a villain. Dragon attempts to stop him from interfering when it is revealed that WildStar is hoping to prevent a beating from happening that he experienced when he was younger. Dragon has seen what interference in such things can yield and fights to stop WildStar from altering past events but when he is struck aside, he opts to stand down and let events play out. The younger version of WildStar is wearing the costume that Dragon is familiar with and he gets to talking with both present and future counterparts. It is explained that the world was left devastated following several invasions. The Cosmic Cops came first but were later succeeded by the Martians which left much of Earth in ruins. It was then that the Gods arrived which proceeded to make things even worse for the planet. Dragon is confused as to why Freak Force did not stop the Cosmic Cops as they had in his own reality but it soon becomes clear that events played out very differently. Mighty Man is still assumed death after the murder of his original host, Robert Berman. SuperPatriot remains a pawn of the government and the remaining members of Freak Force are unfamiliar to either WildStar. Dragon is alarmed that his friends had so little impact and wonders where they all are now. WildStar also points out that any other super-powered officers within the Chicago Police Department may have been difficult after Dragon went crazy and destroyed half of the city. Dragon has no idea what he is being told; all the while he is being led to a massive makeshift tree house city. WildStar is curious as to why Dragon’s mind seems to have been replaced with someone else’s, leading to Dragon explaining about his encounter with DarkLord. The enigmatic SkyLark reveals herself and assures Dragon that if he really is responsible for the world’s current state then it is not general knowledge. She also reveals how she hails from a thousand years into the future, despite WildStar claiming to come from thirty years ahead, where the world had ended. This conversation is interrupted when an alien spaceship swoops down and blows up a section of the city. A host of Cosmic Cops come pouring out of their vessel and overpower Dragon through sheer numbers. 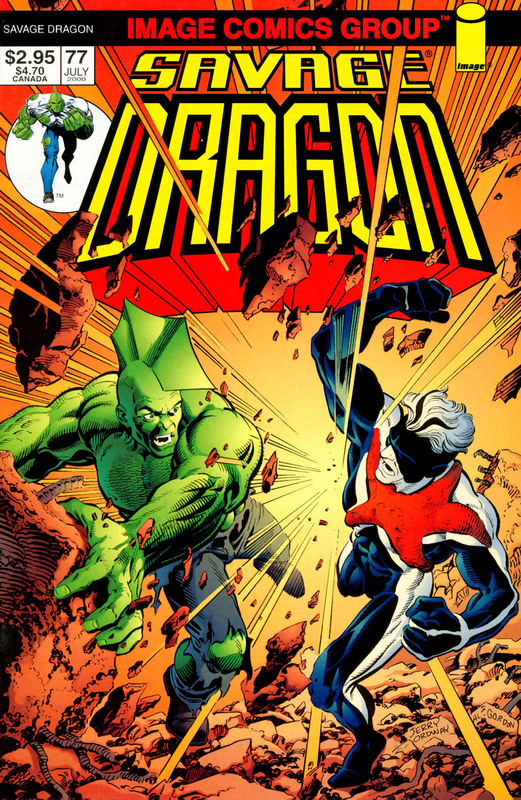 NOTE: This issue features SAVAGE DRAGONBERT by Karl H.